Why wait for February to treat yourself and your romantic other to a special experience? It is always a good time to book a glassblowing class session and learn to create your very own glass Objects of Desire with the accommodating and highly skilled glassmaker Jason Stropko! In one of the most recent classes both students got really into their experience and designed and created outstanding glass projects with Jason. The participants always get as much hands on time with the glass as they are comfortable with. Jason encourages each student to take over their own project as much as possible but is always ready to step in to guarantee that every class participant walks away with some finished work. What would you like to make…? You can follow the shop or take a class with Jason tabs on the homepage for more information on how you could join a class, too. A recent glassblowing Class with Jason Stropko in – wide view! 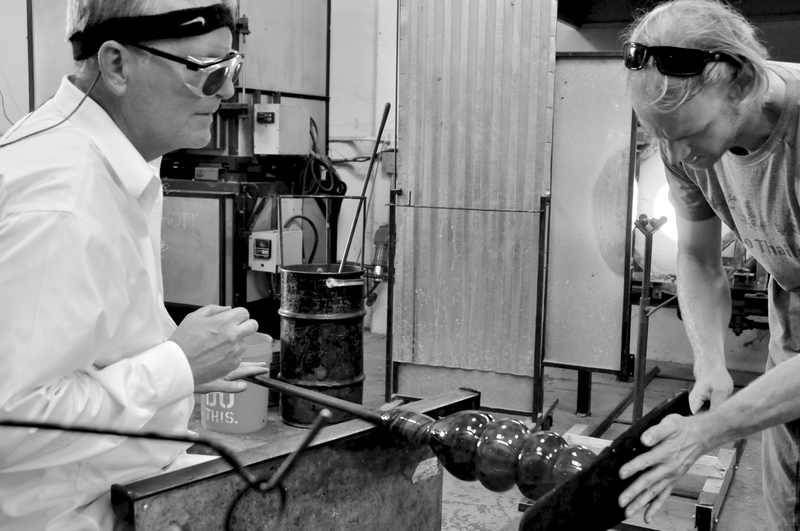 We have been super happy to be working with Verlocal and offering Glassblowing Classes trough their website. Verlocal is kind of like an Airbnb but for experiences. So you can go to their site, check out what’s on offer in your city and book yourself an extraordinary afternoon! – At the moment it is only for major cities in America, but if it takes off then anywhere you live can take part! Working with the video team the other day was excellent fun. We are super grateful that Verlocal decided to support our glassblowing classes and career in the Bay Area with such a huge gesture of appreciation. We couldn’t be happier! Our experience with Verlocal has been very good. Transactions are transparent, with the site handling the money it gives reassurance to potential students / customers / clients and offers protections both ways. The Verlocal Team have been unfailingly supportive and really on the ball, always making sure that customers and we the hosts (we: Jason the glassmaker and instructor & Birgit being the invisible admin on Jason’s team, making a lot of this happen) are always up to date and that nobody falls off the communication wagon. Verlocal do take 15% of transactions which is a little bit of a chunk but we can honestly say are delighted to be on board. The site has brought us students that we otherwise might not have had. We have been very happy so far and look forward to continuing our work with Verlocal in the coming year. We are now taking a little break from teaching classes in the Bay Area for the duration of the typical low season for crafts of all types January – April. So we will be back in time for everybody to wake from their winter slumber, offering even more classes than before! We haven’t got a fixed date for our spring term start but keep connected, here on Jason’s blog as well as on Facebook! You ask what will the glassmaker do in those winter months..? Follow us and we will show and tell.. It will be good! We would like to send a big shoutout for Jason’s friend the London based glassmaker Michael Ruh & his team who are offering weekend Glassblowing classes starting this October. Classes will be for a maximum of 4 students only, 8 hours per day and include a light home cooked lunch. Please follow the link to Michael Ruh’s website for detailed information about the classes and teaching team.